Last night we attended the Deakin University, Richard Searby Oration, delivered by Dr Guy Debelle, Assistant Governor (Financial Markets), Reserve Bank of Australia. His topic was: Credo et Fido: Credit and Trust. The 2012 Oration explored the importance of credit and trust within the financial system and how the breakdown in trust post 2007 and the Global Financial Crisis (GFC) is severely hampering the global recovery. Debelle’s hypothesis is that there is no credit without trust because there is always asymmetrical information in a loan transaction, the borrower always knows more about his/her/its financial situation and intentions than the lender and trust is needed to bridge this knowledge gap and allow the loan to be made. However, trust implies risk, the root cause of the GFC was overconfidence, leading to lax lending practices, supported by a lack of effective due diligence, leading to a chronic underpricing of risk. This allowed highly unethical, if not criminal practices to develop exponentially with institutions offloading risk to other institutions at a fraction of the real price. This complacency and ‘lazy trust’ allowed vast ‘bubbles’ of underpriced risk to develop across the whole financial sector. When the finance system was eventually forced to take a severe look at its situation, trust evaporated, credit dried up and the GFC destroyed value around the world. The sovereign states (ie, governments) as lenders of last resort were in many cases unable to counterbalance the situation because trust in their ability to repay debt also evaporated. Pricing risk requires a reasonable degree of confidence that the parameters of the ‘unknown’ are knowable and a reasonable probability can be assigned to a defined risk exposure. Post GFC the breakdown of trust and confidence in financial markets has lead to uncertainty. When lenders ‘don’t know’ what the risk is they cannot price the risk, set a reasonable premium and use the information to strike a loan rate. If lender cannot set an interest rate for a loan, there is no loan (or the rates are exorbitantly high and the loan periods very short). On-going banking scandals in Europe and the USA are continuing to erode trust and slow the rebuilding, despite money supply being expanded by the central banks. Having money is no good if you cannot trust anyone to lend it to. The thread of argument that can be drawn from the above is that access to the credit needed to fund economic growth is based on a large proportion of a society having enough confidence in their financial systems for a reasonable degree of pragmatic trust to be extended by lenders to borrowers (and the borrowers having sufficient confidence in the situation and system to seek loans). This is as much a function of the underlying emotional settings within a society as the actual facts of the situation. Australia is an interesting example. The GFC had minimal overall effect on the economy due to much tighter fiscal and banking policies, supported by swift government action. The current situation is also good with relatively low debt and the Reserve Bank has significant options open to keep the economy growing. The overall strength of the economy was outlined in a speech entitled ‘The Glass Half Full’ given by Glenn Stevens’, Governor of the Reserve Bank of Australia (RBA), in his address to the American Chamber of Commerce (SA) AMCHAM Internode Business Lunch held in Adelaide on the 8 June 2012 (see: http://www.rba.gov.au/speeches/2012/sp-gov-080612.html). 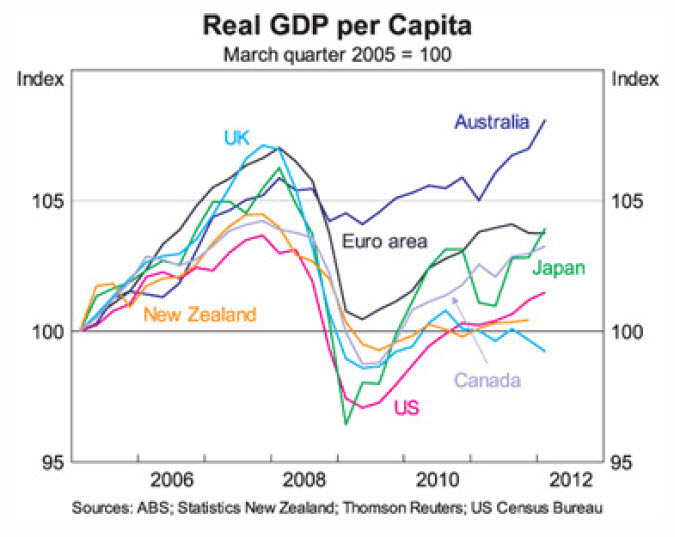 One of the key charts presented by Stevens shows the inflation adjusted per capita GDP in Australia has hardly missed a beat – the GFC had a flattening effect but overall business conditions for the last 5 years have remained basically the same and are improving. GDP = Gross Domestic Product and is directly correlated to the spending power per person (compounded by the growth in the Australian population). The only significant change highlighted in Steven’s report was a shift from an unsustainable growth in personal borrowings back towards a more sustainable savings rate which under any normal circumstance would be seen as good economic sense, particularly given the disasters in places like Ireland, Spain and Iceland caused by excessive borrowing. A survey of business confidence by DBM Consultants shows confidence crashed in the period between 2007 and 2009 and continues to ‘flat-line’ with the vast majority of businesses being concerned about the economy. This flows through into low expectations for increasing employment and taking on borrowings (see: www.dbmconsultants.com.au). The question is why is there such as big disconnect between the financial facts as presented by the RBA and the emotional distrust expressed by business in the DBM report? My feeling is the key driver is the almost unrelenting stream of negative reporting in the press focusing on ‘bad news’ stories such as plant closures rather than good news stories such as the overall growth in employment (even in the manufacturing states such as Victoria), supported by a similar campaign by the federal opposition for short term political gain. This combination of unrelenting negativity will undoubtedly lower the level of optimism in the community (shown by numerous surveys) and lower the levels of trust in the government which as the ‘lender of last resort’ flows through into the financial and business communities. Given the press appear to believe bad news sells papers and the opposition has a vested interest in winning the next election, both legitimate objectives, one wonders what needs to happen to start the shift in confidence highlighted as essential in Dr Debelle’s oration? The belief highlighted in the DBM report above has to be having a direct effect on the rate of growth in the economy because businesses are not investing, not training staff and not employing at the levels they could if there was more confidence – to an extent, the emotions are self-fulfilling. As individuals we cannot do much at a national or international level, but we can learn from the wider world. When dealing with your team and/or communicating with stakeholders a proper balance is needed between achievements and issues. Focusing only on bad news and you will damage future prospects – unrelenting negativity is likely to be self-fulfilling; whilst unfounded optimism is a recipe for disaster if you ignore prudent good practice. Note: these are our thoughts not the ISO Study Groups, although hopefully there will be a fair degree of consensus – to see our full series of post select ‘Governance’ from the Category option or: Click Here. The new WP 1084 Governance Systems & Management Systems looks at the different but interdependent functions fulfilled by an organisation’s governance system and its management system. (Download WP 1084). WP 1033 focused on Corporate (or Organisational) Governance (Download WP 1033). WP 1073 that deals with the subset of organisational governance focused on governing Projects, Programs and Portfolios, PPP Governance (Download WP 1073). From our perspective, the next couple of developments in this space will be internal to the ISO Study Group. The intention of the group is to have its report completed by March 2013 and based on the findings achieve consensus on the way forward, hopefully to develop a formal ISO specification or standard dealing with the important subject of PPP governance. Apart from the storms hail and floods, a highlight of the visit to the university was a too quick tour of the recently opened ‘Origins Centre’ http://www.origins.org.za. The centre showcases recent South African discoveries of two pieces of engraved ochre and, more than 60 marine-shell beads dated at 75 000 years. Theses finds, together with archaeological evidence emerging from other parts of Africa, suggest that symbolic thought and other forms of behaviour regarded as characteristic of modern human beings, began in Africa as far back as 200 000 years ago. This combination of palaeoanthropological and archaeological evidence confirms the hypothesis that fully modern human beings evolved in Africa first, and then left the continent to populate the entire world. • Firstly the intrinsic oneness of mankind – the differences are minute compared to the common bonds and heritage. • The second was the ever accelerating rate of change in the technologies we use. Every ‘new age’ of development occupied a fraction of the time of its predecessor starting with the ‘old stone age’ which lasted over 2 million years. The ‘middle stone’ age lasted some 250,000 years, followed by the ‘new stone age’ which lasted less than 10,000 years and finished with the start of the modern era some 5000 years ago – the modern era includes the Bronze and Iron ages, leading through to modern times. • The future is unpredictable so expect change. The last of these points was brought home immediately after the lecture concluded. My hosts had arranged a dinner at a local restaurant; however, the afternoon storms had flooded the bridge leading to the restaurant and it took a number of attempts to find a way around – the 8:00pm meal started nearer to 9:00pm! Good communication and adaptability led to a great evening but the original plan had to be revised to accommodate reality. The pride passion and hospitality of South Africans is amazing I certainly hope to be able to return at some time in the not too far distant future.